Are you looking to buy a speed camera detector? Want to find a answer to a question that's not answered on our website speed camera detector product pages? This page will help. Look through the list of questions below that customers and visitors have asked. Got a question that's not been answered? Then please complete our online form below and we'll answer and add it to our FAQs. We answer questions on the current speed camera range available at ActiveGPS, which includes the Cheetah c550 Platinum models and Snooper 4 Zero Elite BT. View the complete range here. Q. Please can you tell me which product is the best to buy for detecting all speed cameras including mobile ones? Q. I am a Brit living in Belgium. I'm looking for a speed camera detector with the following specs; Battery charging without any cables to the cigar lighter. Will work in Europe. No subscription charges. Windscreen mounted Could ypu advise which detector would be best one to purchase? Q. Could you please advise me which is the best speed detection camera / mobile camera / laser gun speed traps available and also speed limit warning, for use in Northern Ireland? Q. Are any speed warning devices available with commercial vehicle speed limit warning? Or only national speed limits set? Q. Besides the Snooper 4ZERO Elite BT do you sell any alternative speed camera detector which cover radar and laser? Q. Is there a detector that will give pre-warnings for the mobile speed camera vans? I would really like something that can tell me a laser beam is being operated rather than a database warning. I know that the laser detector will warn when the car is actually targeted by the mobile van, but then this is too late and so the need for an earlier live detection of a laser beam ahead. I have been told that both the Snooper 4Zero and the Snooper 4zero elite can do this. Is this correct? Q. We spend a lot of time in France, I am considering buying a detector but would prefer a small discrete unit with no wires dangling around. I have a 2014 Jaguar XF Sportbrake. Any advice and suggestions. Q. What is the best speed camera detector for use in Republic of Ireland for both speed camera vans (Go Safe) and Garda handheld detectors which I think are radar? Q. Do the speed detection system you sell cover mobile and handheld cameras? Q. What is the best detector for speed camera vans in Republic of Ireland (Go safe)? Q. I recently got caught by a mobile camera van and clocked at 100mph. Would a speed camera detector have prevented that? Q. Not all cameras work on the motorway its the placebo effect to make us slow down. do any of these devices detect weather or not the cameras are live and working as you approach? A. The best and only speed camera detector we sell that features a GPS database (of fixed and mobile speed cameras locations) and a radar and laser detector to detect live 'in-use' mobile speed cameras is the Snooper 4ZERO Elite BT. BT stands for Bluetooth - the Snooper 4ZERO Elite BT is subscribption free and can be updated via a Windows PC, Apple MAC PC or via compatible smartphone (Andriod and Apple) via Bluetooth connectivity. The Snooper 4ZERO Elite BT can be ordered online, where you can also read more including viewing the manual online. ‣Battery charging without any cables to the cigar lighter. Could ypu advise which detector would be best one to purchase? A. The only speed camera detector we sell to meet your criteria is the Snooper MY-SPEED XL. The Snooper MY-SPEED XL uses the same casing as the Snooper S2700 sat nav, so is a fairly large device with 4.3-inch screen. You may see this as a plus or as a negative? If you wanted a smaller device I would recommend the Cheetah c550 Platinum Edition. The Cheetah c550 Platinum Edition does not feature a rechargeable battery and requires connection to your vehicles electrical supply at all times. The Cheetah c550 includes both hardwire and cigarette socket power cables. The Cheetah c550 includes windscreen suction mount and magnetic dash mount. 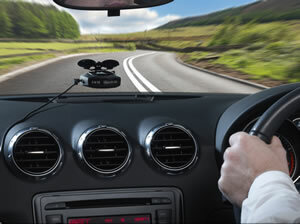 Both of the mentioned speed camera detectors rely solely on a GPS database, the third detector to consider is the Snooper 4ZERO Elite BT which features a radar and laser detector to detect live in-use mobile cameras. Again the Snooper 4ZERO Elite BT does not feature a rechargeable battery and requires connection to your vehicles electrical supply at all times. Please note: detection is illegal in some European countries e.g. France. I do not know the laws regarding their use in Belgium. All three mentioned speed camera detectors are in stock and include FREE lifetime speed camera updates. A. We sell a choice of three speed camera detectors, however not one single unit includes all the features and functions you seek. For speed limit warnings on all UK roads and those in Western Europe, as well as those at speed camera locations, the Snooper MY-SPEED XL is the only speed camera detector to include those. The Snooper MY-SPEED XL does not feature a radar or laser detector. Finally, the Cheetah c550 Platinum like the Snooper 4ZERO Elite BT includes speed limits at speed camera locations only and does not feature a radar or laser detector. It is though a popular speed camera detector and took the Auto Express Best Buy award two years running. A. They only feature national road speed limits, not limits specific to any class of vehicle. The best device to look at is the Snooper MY-SPEED XL(pictured right). A. No, nothing we sell includes radar and laser. Only the Snooper 4ZERO Elite BT. We have in the past sold radar and laser detector from the US, but we found that these weren't always set up for European use. Plus there's no GPS database, so an increasing number of fixed speed cameras are totally undectable by a radar and laser only detector e.g. SPECS, VECTOR, Truvelo, etc. For those camera types you need a GPS database. The Snooper 4ZERO Elite BT features a GPS database, radar detector and laser detector. Giving you the best of both worlds in a single device. A. The short answer to your question is no. The Snooper 4ZERO, Snooper 4ZERO Elite and new Snooper 4ZERO Elite BT are unable to detect in advance a mobile speed camera van using a laser or radar gun. The ONLY time these detectors can detect a laser or radar beam is when one is in use and likely targeting your vehicle. In addition if you are the first vehicle over the brow of a hill, round a bend, or simply the Police/camera operator is waiting for your vehicle to come into range, the Snooper 4ZERO radar/laser detector series can ONLY detect a live radar/laser signal when there is one to detect. The GPS database contains known fixed and known mobile speed camera sites. This is your BEST bet to know in advance mobile speed camera sites. The radar/laser detector built into Snooper 4ZERO detector series will then warn if a live radar/laser gun is in actual use. A. The French authorities have made it illegal/against the law in France to be alerted to speed camera locations. Therefore sat navs and speed camera detectors do not alert to actual speed camera locations - only high risk or accident zones. The Snooper 4ZERO Elite BT would alert to mobile speed camera locations as it includes a radar and laser detector. However, it requires a lead to power at all times (no built-in battery) and if the Gendarmerie catch you with one in use expect a heavy fine! 1,500 EURO fine is what customers have reported back to us. The Snooper 4ZERO Elite BT has yet to be released, the manufacturer has advised us that stock is expected in April. A. The best speed camera detector, and one that is very popular with our customers who live in the Republic of Ireland is the Snooper 4ZERO Elite BT. The Snooper 4ZERO Elite BT features a free to update GPS database of fixed and mobile speed camera locations (including Republic of Ireland). The Snooper 4ZERO Elite BT also features a radar and laser detector to detect live in use radar/laser based camera vans, etc. A. Yes, all the speed camera detectors that we sell inlude an updatable GPS database of fixed and mobile speed camera locations. In addition to the updatable GPS database, the Snooper 4ZERO Elite BT includes a radar and laser detector to detect live 'in-use' mobile and handheld radar/laser based cameras. A. Being based in the UK, we do not know exactly what technology the Go Safe vans are using in the Republic of Ireland. However, if it's anything like the UK, they will be using a combination of radar and laser based guns. The Snooper 4ZERO Elite BT is the only speed camera detector that we sell to include both a radar and laser detector. The Snooper 4ZERO Elite BT also includes a GPS database (which is free to update) of fixed and mobile camera locations, these include Republic of Ireland within the database. Other customers in the past who live in the Republic of Ireland have purchased the Snooper 4ZERO Elite BT from us. A. If, for example, you buy a Snooper 4ZERO Elite BT... which is the only product that we sell which has THREE technologies: a GPS camera locations database, laser detection and radar detection. In our website description we advise that you will receive alerts to ‘known (mobile) speed camera locations’ via the Snooper AURA safety camera database, and ‘when you come into range of a live device’. It may be the first time that the Police or Road Safety Partnership have used a particular mobile location (or it is in temporary roadworks) - if so it will clearly not immediately be in the AURA GPS speed camera locations database. Importantly, you will only receive a warning of a laser or radar signal if you are actually being targeted by a live radar or laser gun. If it was a genuine speed check, the Police radar or laser gun/device needs to be switched on, be live, and be pointed at your vehicle. This is when you will receive a radar or laser warning. Although the Police usually take more than one reading, if you are the first car over the brow of a hill, or a bend in the road, then they may take a successful first reading. The Snooper 4ZERO Elite BT WILL warn you of a live camera (if you are targeted) but clearly if they already have your confirmed speed at first targeting then the warning will be too late. This is why it is also good to have the back up of a system with a GPS database - subject to the limitation of it already being in that database. A. Yes and no. It all depends upon the technology used in the speed camera. For example Gatso speed cameras use radar technology. Therefore if you buy and use a speed camera detector such as the Snooper 4ZERO Elite BT with built-in radar detection, you will receive warnings when cameras are live and active. On the other hand though speed cameras such as Truvelo, Truvelo D-Cam, SPECS and VECTOR all don't use any form of radar technology. The only people to know whether these cameras are live are the police and camera installer. The only way to ensure you're not caught speeding is to drive at or below the speed limit when passing any speed camera. You can compare the full range of speed camera detector we sell.